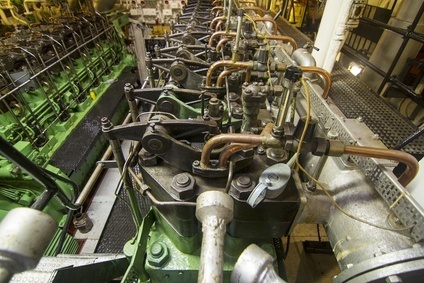 Diesel ship mechanics, also known as ship engineers, focus on the maintenance of diesel-powered ships. Individuals who love the sea and enjoy working on diesel engines can find many employment opportunities in this industry. Larger ships often operate with numerous engineers, including the chief engineer and varying ranks of assistant engineers. For those interested in becoming a certified diesel ship mechanic, earning an associate or bachelor’s degree provides the necessary training to succeed in this field of expertise. Aspiring diesel ship mechanics need to first finish their high school diploma or GED before enrolling into any diesel technology or marine certificate program. More stringent programs require potential students to have previous coursework in physics, mathematics, machine shop, and woodworking, which prepares them for the repair techniques and methodologies they will learn in a diesel technology program. Diesel mechanics who work on diesel-powered ships need to have good hand-eye coordination, strong mechanical aptitude, diagnostic capabilities, and sea living abilities. Even though some employers hire diesel mechanics who have previous experience in this field, most prefer those who have completed some formal education. Depending on the career level in diesel engineering that individuals want to reach, earning a degree or certificate trains students on the inner components of diesel-powered engines. The Associate of Science in Diesel Technology prepares students for entry-level positions on marine vessels, where they will ascertain the necessary on-the-job training to succeed as assistant diesel engineers. When searching for a diesel technology program at a vocational, community, or technical college, students should ensure the program is accredited though a governing organization, such as the National Automotive Technicians Education Foundation (NATEF), which will prepare them for further certification in a marine specialization upon graduation. Diesel mechanics who wish to become chief engineers on a marine vessel need to further their education and earn a Bachelor of Science in Merchant Marine Engineering, which can take upwards of four years to complete. In order to ascertain a higher paying position, diesel mechanics should be able to communicate effectively with clients and be familiar with onboard computer systems. While enrolled in a bachelor’s degree program, students will be able to specialize in a certain sector of the industry, whether it is cargo transportation or cruise ships. When it comes to technical skills, a bachelor’s degree provides the essential technical skills to be successful in this career, ensuring students have the necessary knowledge of ship’s computerized diagnostic equipment, power tools, and generalized systems. No what degree program diesel mechanics graduate from, earning the proper licensure or certification is vital to ascertaining a higher paid position on a marine vessel. Diesel ship mechanics need to earn the merchant marine credential (MMC) through the United States Coast Guard (USCG). Once individuals have passed the necessary background checks and approval process, they are eligible to take the MMC exam, which covers generalized topics like control engineering, engineering safety, electronics, environmental protection, and electrical equipment. Mechanics who wish to work on the various types of propulsion engines, such as steam and motor, gas turbine, motor only, and steam only, need to take the correlating tests to obtain the appropriate credentials. Diesel ship mechanics who earn the MMC can seek employment as a third assistant engineer. In order to obtain the second assistant engineer, first assistant engineer, or the chief engineer position, mechanics need to reapply and take the appropriate exams for the advanced rank. Diesel ship mechanics who wish to reapply should have previous experience with the prior grades, and every five years, mechanics need to renew their credentials and be up-to-date with their TWIC card, drug testing, and physical examination. According to a recent report released by the U.S. Bureau of Labor Statistics (BLS), the water transportation industry employs approximately 81,600 workers, including diesel ship mechanics. The employment outlook for this industry is projected to increase by 13 percent by 2020, providing 10,900 more jobs for potential candidates. The BLS reports that diesel mechanics who work on marine vessel engines can make a median annual salary of $48,980, with ship engineers making $70,890 annually and motorboat operators earning $35,190 annually. From small engine repairs to marine vessel maintenance, diesel ship mechanics play a vital role in the marine industry. With the increased number of supplies and people being transported over the water, companies are seeking individuals who are proficient in diesel-engine repair. Individuals who are contemplating a career in this industry need to earn the necessary degree and certification to increase their chances of success and job stability.